MDC SG Mwonzora says MDC must reserve posts for women and youths and all regions at the higher echelons of the MDC’s leadership. FORMER Nyanga North MP and MDC secretary general Douglas Mwonzora has finally emerged from his closet and declared his readiness to wrestle current party president Nelson Chamisa for the country’s biggest opposition job. “Our congress must not only be about elections but must also be a festival of ideas. This congress must be an occasion to reflect on our strengths and weaknesses, culminating in the adoption of far reaching resolutions that must position the MDC for a resounding victory come 2023. “Together we must ensure the MDC remains a robust, vibrant and modern institution ready to take Zimbabwe forward,” Mwonzora said. Amid reports of violence, intimidation and coercion in the run-up to the congress, Mwonzora said the MDC needed to rise above “archaic political practices”. “The ongoing violence and intimidation of members from exercising their democratic right to choose is a serious affront to the very tenets and democratic principles on which the MDC was founded. These are acts of cowardice by people afraid of contestation. “A recent development where some elements within the party have sought to mudsling and tarnish others so as to discredit their candidature is regrettable. “As a party, we have gone through very difficult and turbulent times in the past five years; having lost our iconic leader, Dr Richard Morgan Tsvangirai, and suffered a stolen victory in 2018, we must therefore come out of this congress with a renewed, reinvigorated and focused institution. This must reflect in the resolutions that we adopt at the congress. Our resolutions must reflect a 21st century party, pliable to the ever changing global circumstances,” the Manicaland senator said. He said the upcoming congress set for the end of May, presents the MDC with a chance to “showcase” its democratic credentials. “As the secretary general, I strongly believe in a united, democratic, tolerant and above all a disciplined party. To this end, there must be robust, non-violent contestation in which people must shake hands afterwards and allow the party to move forward with renewed impetus,” said Mwonzora, who has thus far only been nominated to remain the opposition party’s chief administrator. His rival, Chamisa, has thus far been nominated by three provinces for his first full mandate as party leader following the death of Tsvangirai last year. At the 2014 congress, the constitutional lawyer defeated Chamisa despite having received only one nomination for the position of secretary general, against his rival who was seemingly unstoppable with over 10 nominations. 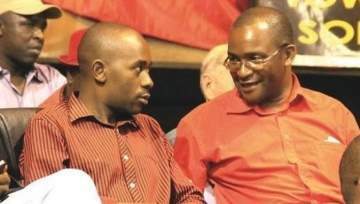 Mwonzora, in the statement, said the crop of leaders to emerge must inspire Zimbabweans ahead of the next elections. “The caliber of our leadership from this congress must be a beacon from which our populace must draw inspiration. We expect a new crop of dynamic and robust leadership which will serve the people of this country diligently with respect and take Zimbabwe back into the community of progressive nations. “It is therefore important that all of the leaders be democratically elected to reflect the true aspirations of the people,” he said. Mwonzora added that the MDC needed to consider reserving certain positions for women and youths as well as make sure all regions of the country are adequately represented at the higher echelons of the party’s leadership. While reports said Mwonzora was part of a group of leaders who pushed for constitutional changes to have the party president given ‘imperial powers’, the MDC secretary general suggested there was need to reverse this.